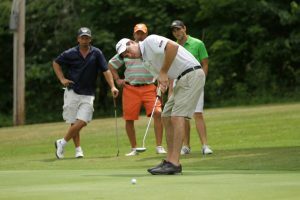 Thunderhart Golf Course is a championship 18-hole golf course located in the Great Northern Catskills of Greene County and is part of Sunny Hill Resort. The resort boasts 36 holes of golf which includes 18-holes of resort-style golf at Sunny Hill and 18-holes of championship golf at Thunderhart. For avid golfers, dual memberships are available for both courses. This championship course, par 72, is set in the Catskill Basin, and offers 11 ponds and 15 sand traps. In addition to breathtaking views, this 6482 yard course is a “must play” with its scenic beauty and challenging design. The front nine provides a traditional golf experience. The back nine was created in the Parkland style, which has each hole cut through the beautiful forest of the Catskills. Acquired in 2007 by the Nicholsen family, owners of Sunny Hill Resort & Golf Course, Thunderhart has been transformed into one of the region’s premier golf complexes, under the supervision of the golf course superintendent, Erik Nicholsen, and his experienced staff. With the Clubhouse Grille, Fireside Lounge, and outdoor Pavilion situated next to a scenic pond, Thunderhart is the perfect setting for a group outing or just to sit and discuss the day’s round with a group of friends. Thunderhart has everything a golfer could want: scenic beauty, challenging design and layout. Come find out why Thunderhart is a “must play” destination for all golfers. Great Value If you’re looking for a deal – Mondays – Tuesdays, Wednesdays, and Thursdays are Senior Days – 18-holes with a gas cart for only $25! Good Friends – Fun Times – Great Golf!